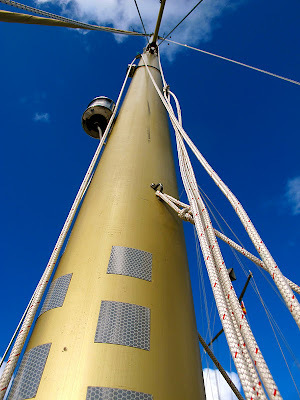 This is our quiet, well bungeed mast. No noise! 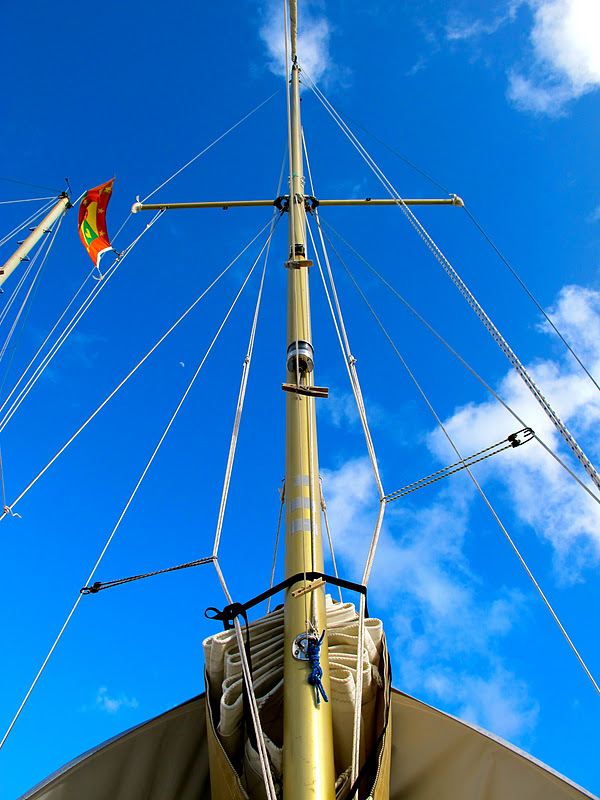 Last week, I wrote a post about bungeeing another boat's super annoying, slapping halyard. Lots of people either commented on it via the blog, Facebook, or email and several of you had never heard of bungeeing halyards and were curious how to do it. First of all, it's so easy it's ridiculous. Second of all, I am more than happy to show you how lest we ever end up neighbors one of these days. Step 1: Grab a bungee (or shock cord, or line, or whatever else you would like to use). You might need more than one (right now we have three on our mast). Note: I do not believe you can ever have too many bungees on a boat. They are SO useful. Step 2: Identify slapping halyard. Simply snugging up the halyard(s) will not be enough. You will need to pull them away from the mast. In this case, it's the lazy jack lines that are loose and banging agains the mast. Step 3: Pull lines away from mast with your hand. Secure one side of the bungee to the nearby shroud, and wrap the bungee around the line(s). 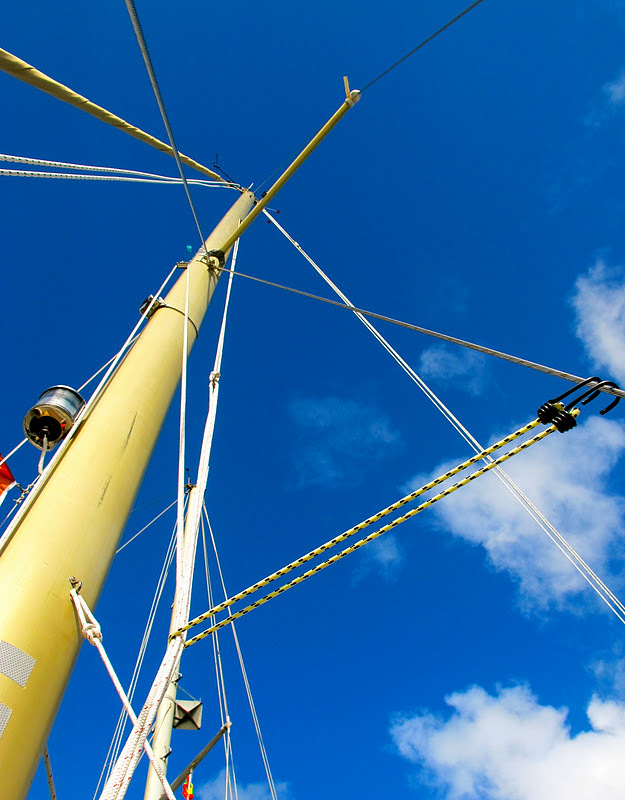 You may need more than one bungee if you have multiple slapping lines on either side of the boat, you may need to play with the tension and/or you might need a different length of bungee depending on the distance between your mast and shroud. Just play with it, I promise you there is a solution. Step 4: Bring the other end of the bungee back to the shroud and attach it. See how the lines are now taut and pulled away from the mast? No more banging and clanking keeping us and our neighbors awake! This entire process took about 45 seconds. Hope this helps! Have a great weekend friends! Labels: boat maintenence, common questions, lessons learned, tips and tricks, who knew? 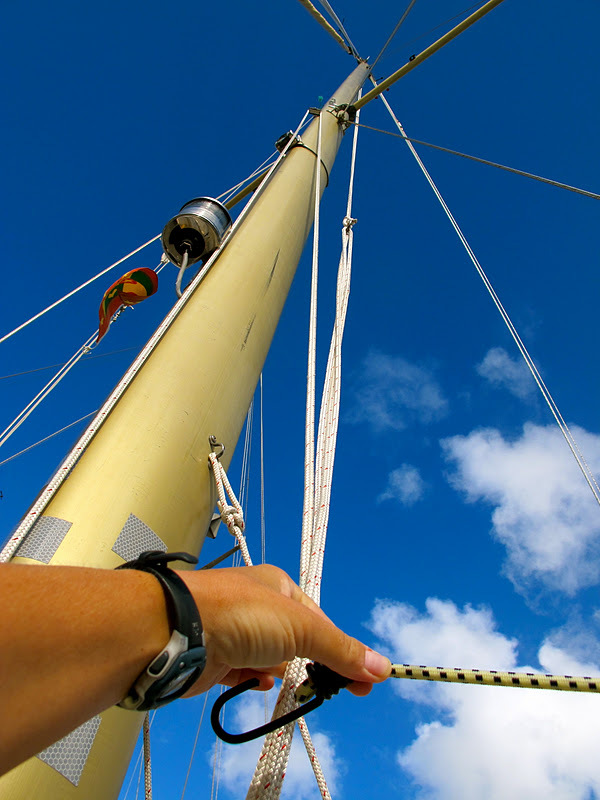 We attach our halyard (nice and tight) to our life line and that keeps it from slapping against our mast. We have an in boom furling main so re-attaching it takes no time at all. But I do love bungees! You can't have enough of them. I'm torn. On one hand, if you're trying to sleep, I understand how it's annoying. On the other, that same noise lets me know that I've made it safely through the Pine Barrens and arrived at my boat. I'll take the second hand. Brittany & Scott...I'm all with you on this. I gladly trespassed on an unoccupied sailboat this evening to remove a slapping halyard that was wrapped around a radar dome and then secured tightly to the bottom of the mast like a guitar string. We un-did the whole thing and made a statement by tying the halyard off to the pulpit/anchor and stuffing a copy of this article in the door. I've been hounded by this for months and finally, I had had enough and boarded the boat and fix it. At last the pier is silent. The was the only boat on a pier of around 85 boats that had a slapping halyard. First offense, I tie it off; second offense, I cut it and let it fly off the block - I've done that before and eventually the guy was asked to leave the marina.